I have “pitta” type of constitution and as a result my body temperature is always slightly higher than the average. Most of my friends usually remark that my hands are amazingly warm as compared to theirs. So I guess I need more of ‘cooling foods’ to combat this overactive “pitta” in my body. One such cooling food that Ayurveda recommends is “Gulkand”. 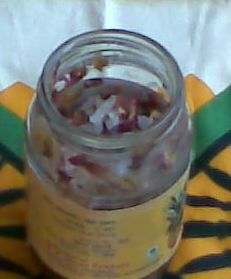 It’s a type of rose petal jam / preserve that supposedly reduces the heat from the body and is excellent for pitta types. Now Gulkand is also commercially available, but I couldn't bring myself to use store-bought Gulkand. Who knows what kind or roses are used? They could well have used pesticide sprayed roses and also chemical preservatives in it to lengthen its shelf life. 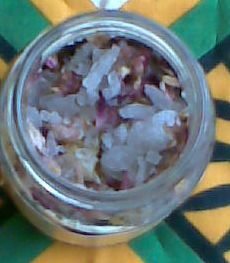 However traditional Gulkand or Rose Petal Preserve is basically devoid of any chemical preservatives and is said to last for years but you are never sure whether the same procedure is adopted during its mass manufacturing. A safer bet is to make use of Homemade Gulkand. Moreover it’s extremely easy to prepare, even an 8 year old child can try her hand on it, albeit it takes a month or so for it to be full ready. 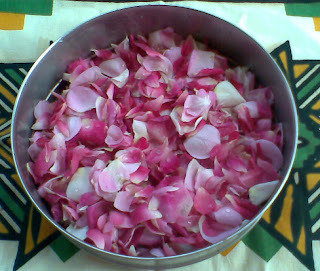 I happened to be at my parents’ place a fortnight ago and after seeing the variety of sweet smelling roses in different hues and shapes adorning the garden decided to prepare Gulkand. Of course, I felt a bit of remorse while plucking all the roses. After all, roses look best on plants. But then, there were several buds too and these would soon bloom into beautiful roses, I consoled myself. First of all separate the rose petals and wash them in clean water to get rid of dust, insect larvae etc. (While selecting the roses, look for clean ones with firm petals and discard the ones with spots, blemishes etc.) Then place them on a towel to dry. you can even keep it in the sun for around half an hour to dry. Remember to use only dry petals. Now take a wide-bottomed glass bottle; you can even recycle an old jam bottle for this purpose. 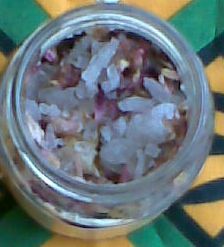 Put a layer of rose petals at the bottom of the jar. Next add a few teaspoons of sugar to form another layer. (I used rock candy / candy sugar.) Keep on adding alternate layers of petals and sugar. Now separate cardamom seeds from their shells, crush them in a mortar and pestle and add cardamom powder to the mixture (this is optional). Then close the mouth of the glass jar with a thin, but clean cotton cloth and keep it in the hot sun for around 5-6 hours (10 am to 4 pm) everyday. After you bring it indoors, remove the cloth and close it tightly with its lid. Do this everyday. Once in a few days stir the contents of a jar with a sterilized spoon ( use a wooden spoon). 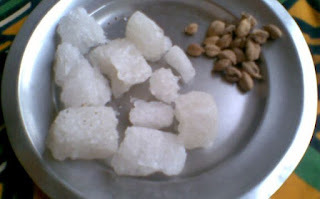 Sugar will slowly melt and in around 4-6 weeks your Gulkand should be ready. Storage: Once it’s done, ensure that the lid is sufficiently air tight and keep it indoors in a cool dark place. It’s not necessary to store it in the refrigerator. Usage: Take 1 tsp of Gulkand once in the morning and once in the evening. It's not that I have never used Gulkand before. But this was the first time that I had prepared it all by myself. My Gulkand isn’t yet ready. But it’s already emitting a delicious, Gulkandi aroma making me nostalgic, reminding me of my grandma. My grandma, a wonderful lady used to stuff me with spoonfuls of her delicious Gulkand in my childhood and though I loved it, I had completely forgotten about it! Now this preparation and aroma transported me back into time to those fun-filled, carefree days! As soon as my Gulkand is done, I’ll use it and update you all on how it has worked for me. 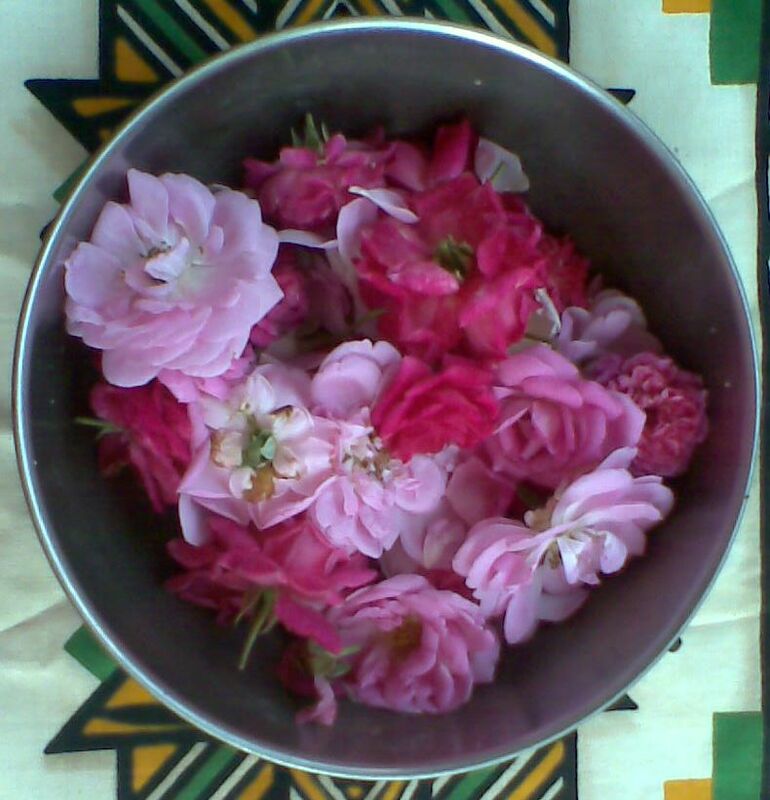 Gulkand may be used to make rose flavored teas and drinks. Gulkand is an effective skin tonic which both clarifies and tonifies the skin..
Rose petals are useful for reducing pitta (acidity), heat in the body and problems caused by excess heat. Rosewater is cool, refreshing and reduces eye inflammation and redness. Regulates menstruation and helps reduce excessive menstrual bleeding. Gulkand relieves heat-related imbalances and clears and tones the intestines.Effective in the treatment of acidity. The rose aroma relaxes the brain and heart. It can be used to reduce side effects of allopathic drugs such as antibiotics, anticancer drugs etc. If consumed in small amount it helps reduce the frequency of motions but acts as a laxative if taken in large quantities. Hence it can be used to treat both loose motions as well as constipation. It helps facilitate digestion and reduces nausea. It helps in increasing urine output and hence may be given to the individuals who have problem of water retention. Is there sugarless gulkand available. people suffering from diabetes need to avoid it. Also obese people may consume this in reduced quantity. i wonder to know the benefits of gulkand... from today onwards i am fan of this recipe. I get mine from Shaelala when I don't want to make my on. Would include the link but it says not to. They carry natural stuff.